Although PocketSmith won't automatically remove transfers from the Transactions income & expense pie chart, you can learn how to remove them in the user guide below! Unlike the automatic removal of transfer categories from other reports, PocketSmith doesn't automatically exclude transfer categories from the transaction pie chart. The Transaction pie chart displays a breakdown of your categories and will always reflect the current search criteria of your transactions. This means you will need to change the search criteria to remove transfers from the Transaction pie chart. 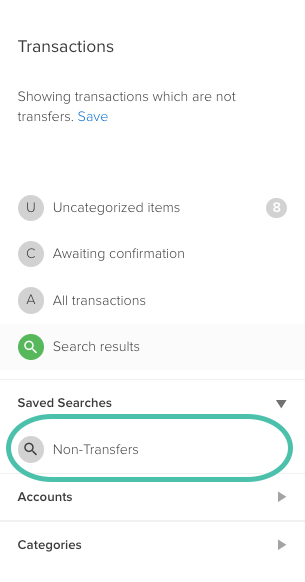 If you want to view non-transfer transactions often, then after performing the search, click SAVE, and it will then show in your Saved Searches on the side panel of the Transaction page.